See the list of awards won by clubs in our District! District IV of the Florida Federation of Garden Clubs is comprised of FFGC-affiliated clubs in the northeastern part of Florida. These include clubs in Baker, Union, Nassau, Duval, Clay, St. Johns, and Putnam counties. See the Member Clubs page for more information on these clubs. See the Leadership Directory for a list of District IV officers and committee chairs. Instructions for sending District IV membership payments are also provided on that page. There are twelve Districts comprised of garden clubs state-wide. 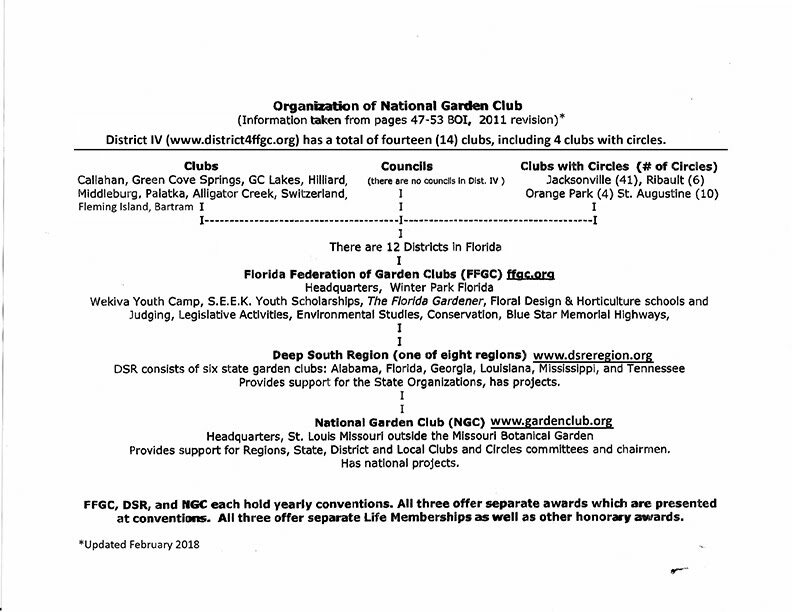 These Districts are part of the Florida Federation of Garden Clubs, which belongs to the Deep South Region of Garden Clubs under the National Garden Clubs. Organizational addresses as well as officers for each of these organizations and their contact information are listed on the FFGC Yearbook Information Document. Links to their websites and Facebook pages are on our Useful Links page. Click on the image below for the District IV organizational chart (Adobe PDF document) from the BOI (Book of Information). If you live in northeast Florida, one of our clubs may be near you. Club web pages or Facebook names are listed on the Member Clubs page. You are encouraged to contact one or more of them if you'd like to get to know the members and attend a few meetings before joining. If you still have questions about the District or its clubs, please contact one of the District Officers or the Membership Chairman listed on the Leadership page. If you are a Florida resident, contact our Florida Federation of Garden Clubs for other state clubs. Our National Garden Clubs has resources to help you find a local club in or outside of Florida. So what are you waiting for? This website represents District IV and showcases District activities and announcements. Note that there is a Sitemap page to help you locate items in this site; the link to it is on the left sidebar. There is also a Search feature shown in the upper right-hand corner of each page. If you have questions about this website, please use the Contact link. Home: Blue Morning Glory by Heike Loechel under Creative Commons licensing SA 3.0. About Us: Gaillardia image provided by USDA is in the public domain Wikimedia Commons. Announcements/News: Magnolia flower Duke campus by DavetheMage - Own work. Licensed under CC BY 3.0 via Wikimedia Commons. Calendar: Passionflower Image is in the public domain Wikimedia Commons. Leadership Directory: Orange blossoms By Ellen Levy Finch (Elf) (Own work) under Creative Commons licensing SA 3.0. Member Clubs: Bartram's Ixia Used with permission from the photographer, Pete Johnson at the Florida Native Plant Society. Contact: Trumpet Honeysuckle with Ruby throated hummingbird by JeffreyW (Own work) under Creative CommonsAttribution 2.0 Generic License.